← Rockledge, Pennsylvania. March 7th, 2013. Doris Jenkins gets a real mother’s day surprise when she realized a sinkhole was forming underneath her Bethlehem Township home. The township was fixing a smaller sinkhole near the sewer lines last week and, before she went to bed Saturday, she noticed her ceiling starting to separate from the wall at her home, 1502 Second St. She awoke at 4 a.m. to the sound of one of her three dogs barking and took them for a walk. The hole, which township officials estimated had reached 30 feet wide and 12 feet deep by noon, is part of a larger sinkhole that emerged in the aftermath of some sewer line work done this week in that neighborhood near the Wilson Avenue intersection. Township officials evacuated Jenkins and her daughter, Ingeborg, from the home, and checked nearby homes. Officials say no other houses show signs of structural damage. Township Manager Howard Kutzler, who was in the neighborhood early Sunday afternoon, said sinkholes can be dangerous, and people should not take them lightly. He said he expected engineers to arrive later Sunday or Monday to survey the size of the sinkhole. Ron Ford, assistant chief at the Bethlehem Township Volunteer Fire Department, estimated the sinkhole could be as big as a half-block. Sinkholes grabbed national headlines two weeks ago when a 37-year-old Florida man died after a sinkhole opened up beneath his house and swallowed the bedroom in which he was sleeping. Locally, a sinkhole discovered last July beneath an Allentown home in the 800 block of North Fifth Street forced the evacuation of a block of row homes. In December 2011, a sinkhole engulfed a half-block of homes on North 10th Street, damaging homes and threatening the nearby cemetery. Limestone is prominent in the Lehigh Valley. Limestone is prone to sinkholes because of its solubility when water comes in contact with it. The southern half of Bethlehem Township contains a lot of limestone, township officials say. Ford said Sunday’s sinkhole is the first major sinkhole he is aware of in that neighborhood. Earlier this week, township officials had a sewer line fail in Jenkins neighborhood. Township crews dug up a sewer line in the neighborhood and fixed two smaller sinkholes that had opened up. On Sunday morning, the township shut down the pump house and trucked the sewage to the treatment plant, off Shimersville Road in Bethlehem. The sewer line that runs through Jenkins’ neighborhood can carry up to a million gallons of sewage a day. Officials say it was installed in the 1970s. “It’s not a small line,” Ford said. He said township officials are monitoring the neighborhood to ensure gas from the sewer lines does not back up into the homes. Jenkins’ house was blocked off with yellow caution tape. Neighbors in the middle-class neighborhood of bi-levels and ranch homes milled outside in the warm winter weather to watch crews work. Karen Leschinsky, who lives next door to Jenkins, has lived in the neighborhood for 25 years and never saw a sinkhole as large as the one that began forming Sunday. 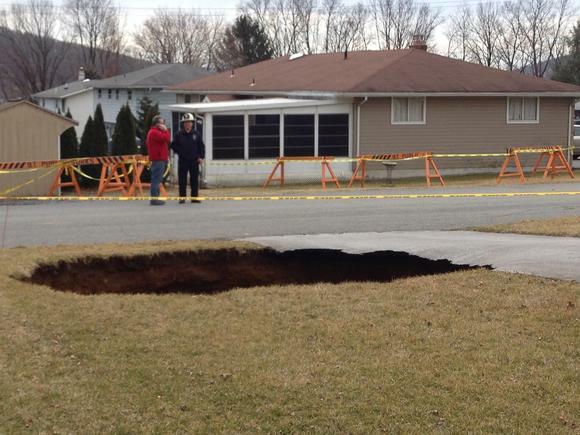 This entry was posted in Pictures and tagged Bethlehem, Pennsylvania, sinkhole. Bookmark the permalink.